Creating the vision for a transformed healthcare environment through second decade (cloud and wireless applications) technologies is what draws this group of partners to Fargo each year. Here are some excerpts of discussions we had there. As healthcare is transformed from the traditional view of centralized delivery models—the citadel of Doctors and the hospital—to the highly distributed and diverse set of services and locations, technology becomes the enabler. Many progressive examples of wireless and Real-time Locating projects were presented by some leaders in healthcare—Santa Clara Valley Health and Hospital Systems, Texas Health Resources (THR) and Butler Health Services, to name a few. These organizations are pioneering the use of both cloud platforms (from Intelligent InSites) as well as a rich set of wireless technology and devices. These are used to integrate staffing, patients and assets, with Electronic Medical Records (EMR), as well as manage the complexity of devices and monitoring systems, to assure exceptional healthcare, at higher levels of efficiency. Just what the doctor ordered, as far as what patients need right now. There is more beyond the super interoperable clouds that connect EMR, asset and staffing locating. The real success of a Connected Care system will be driven by patient centricity. 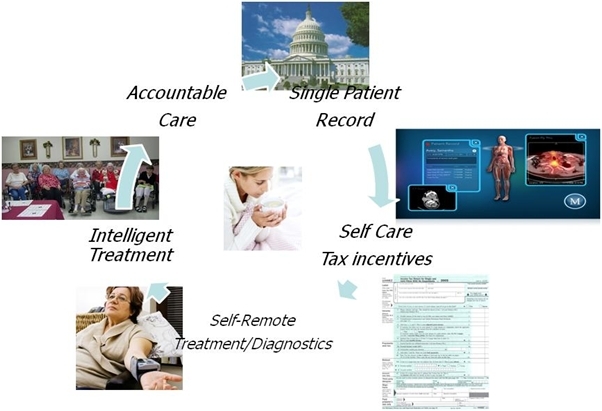 An empowered healthcare consumer can interact wirelessly with a healthcare professional, whether human or a virtual healthcare provider (reasoning engine with powerful logic based on the latest patient outcome research) to understand treatment options and direct her own regime of care. 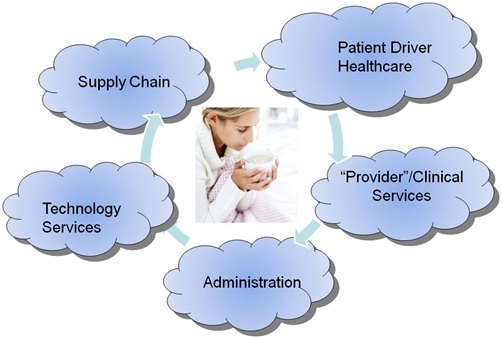 Process changes will come with a redefinition of the Supply Chain for the healthcare establishment. Today, there is no real Supply Chain executive, as other industries would define them. (See our upcoming article on the SC Executive for the 21st Century Chain of Care). Supply Chains will change, as more partnerships leverage common assets, and efficiencies and cost issues get addressed, as they must. Also, as hospitals work more closely in alliances or Integrated Delivery Networks, the ability to leverage knowledge and assets and distribute services across the network will reveal better care in each category, as an improved economical cost. Just as the business community has learned about organizing based on ‘core competencies’ (what ChainLink calls Federations), the regional and often remote (connected again in the cloud) service model can load balance as well as offer precision in performance. Boost provides apps on the mobile platform, iphone or droid to educate the consumer as well as assure patient adherence to their treatment plan. Very cool apps. KnowMyMeds, have you ever wondered about drug interactions or whether you’re taking the right meds? This site is for consumer and healthcare professionals. Ekahau is a leader in Wireless Locating (RTLS), the defacto leader in healthcare wireless. Tagsys has been a player in the pharmacies supply chain for years. Their RFID infrastructure is used in many health-sensitive applications for Identification and patient security. ZCura focuses on both strategic procurement of extremely high value assets as well as compliance tracking. Preserving the quality and safety of bone and tissue, biologics, and medical device implants is critical to patient health and often to survival. ValueCentric improves the data and visibility across the Pharmaceutical supply chain. A big win here is patient adherence opportunities, since that becomes a win for all—patients get better when they actually ‘take the treatment,’ and pharmaceutical and pharmacies actually sell more products. The Healthcare Reform bill, with over two thousand pages, is a document loaded with opportunity to improve healthcare though technological innovation, and incentivizing changes in behavior for the medical profession. As patients get more empowered, and new generations of care professionals who are tech savvy assume key roles, the patient takes center stage, but always in communication with the digital world of care. A single patient record—your record—that the patient controls and manages that also has linkages to intelligent treatments sites, can help the patient (and doctor) review alternative forms of care, decide on a course of action and then monitor results. This all becomes part of the statistical world of ‘outcomes.’ If it worked well for a set of patients with similar profiles, over time this becomes the standard protocol. We all become smarter. Healthcare reform has incentivized the models for EMR and many compliance strategies. It will take a decade before this vision is fully realized, and there will be challenges ahead. The obstacles are not technical so much, as huge changes in culture in the healthcare industry, as well as a new generation of patient. See also Connected Care Part Two.